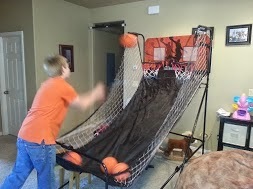 Before my son Michael got taller than me, he challenged me to a game on this electronic basketball court. It automatically counts the baskets made by each player, which helps a lot when all you're really after is aiming and shooting and making more baskets than the person next to you. After our first round, Michael had beaten me by more than DOUBLE my points. But he was so much younger, shorter, and less experienced than me! "How did you do that?" I asked in amazement. "I kept my eye on the basket," he replied. "What about picking up the basketballs?" I asked. "I have to look down and pick them up." "Just reach down and grab them without looking." "How can you do that? Doesn't it take more time?" He grinned knowingly and glanced at the score board. "Not really. You know they're there. You just reach down and grab one while you keep on looking at the basket." He had won the game handily, which proved the worth of his counsel, so I tried it. AFter the second round, we nearly had the same score, but he still won. Of course, he'd had more practice, practice, practice! This impressed on me the age-old point that if you keep your eye on your goal, you'll accomplish it much more easily and better than if you keep letting yourself get distracted. Get your tools lined up where they're near at hand and keep your eye on what you want. With this technique in mind, what amazing things are you doing this New Year? 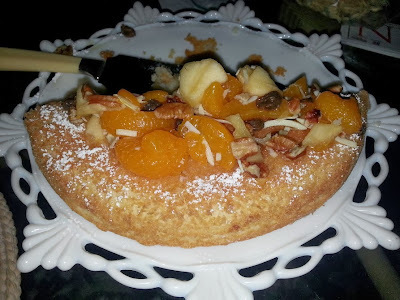 Personally, I've never cared for fruitcake until my friend, Roy Leabig, who has lived in Hawaii for years, made the delightful cake pictured above. (He didn't call it "fruitcake," but I do!) It's a white cake with tropical fruit, nuts, and coconut on top, sprinkled with powdered sugar. Take my word for it, it tastes even better than it looks, and that is one pretty cake! So give a try, then tell me, what do you think of Roy's Hawaiian Fruitcake? 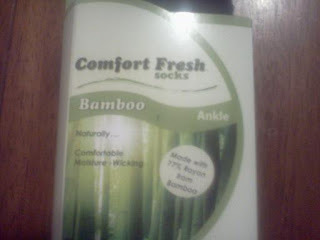 Anyway, bamboo grows fast, so when your socks wear out, you can just buy some new ones and throw your old ones away, because they are BIODEGRADABLE and won't clog up landfills! They are also soft and warm (I'm wearing some right now) and have a fancy little logo on the sole. The only thing I'd warn you against is wearing them to the zoo. Don't get too close to the panda enclosure! What unusual clothing items have you worn? Do You Have Your Christmas Tree Yet? There must be a way that this evergreen could be part of the Christmas festivities. In the olden days, people threaded popcorn onto strings to drape around a tree. In this tree's case, you could forgo the needle and thread and simply stick popcorn kernels on the tree needles. Ditto with the cranberries. Now we've got red and white decorations. 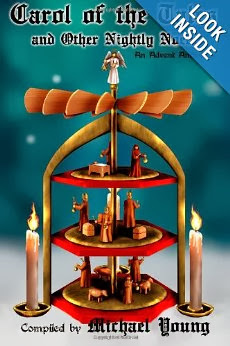 Perhaps you could convince a real angel to flutter above the tree top. Or else you could light it the old-fashioned way, with candles that sported an open flame. There is a possibility that the tree could catch fire that way. If it does, then voila! 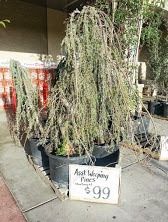 You have a nice cheery Christmas bonfire, and the weeping evergreen tree has served its Christmas purpose of giving warmth and joy to the household. What does your tree look like this year? CAROL OF THE TALES musical celebration! This delightfully eclectic collection of Christmas stories, with one tale for each day leading up to Christmas, is being celebrated at concert to honor veterans on Pearl Harbor day by a variety of musicians, including the Saltaires Barbershop Chorus. Don't miss this Saturday, December 7 event! CLICK HERE for details to treat yourself to a memorable holiday experience! 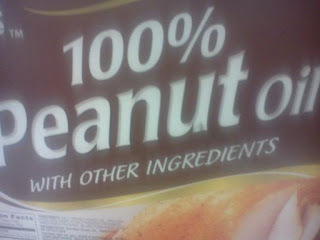 100% Peanut Oil, or what? Since nuts are a big part of Christmas gift giving both in the family I came from and in the family I married into, I was curious to take a closer look at this can of peanut oil I saw in the store. The one thing I couldn't figure out is if 100% is ALL of something, how in the world could it fit in "other ingredients?"